The new Windows Live suite includes three different services for file storage and online synchronization. They are called Live Mesh, Windows Live Sync and Windows Live SkyDrive – all apps are available for free and you just need a Windows Live account to get started. Windows Live SkyDrive requires no installation and you get 25 GB of free storage space though the maximum size of an individual file / document cannot exceed 50 MB. Each file or folder on SkyDrive has a unique Web address (URL), so you can easily paste that link into email messages or other documents for direct access. Say you have music files stored in your home computer’s hard disk and want to access this collection from the Office computer. 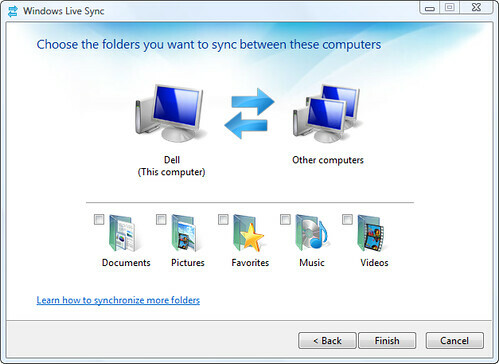 Simply install Windows Live Sync of both the computers and add “my music” folder to your “personal folders” – now your entire music collection will be accessible from either of these computers. 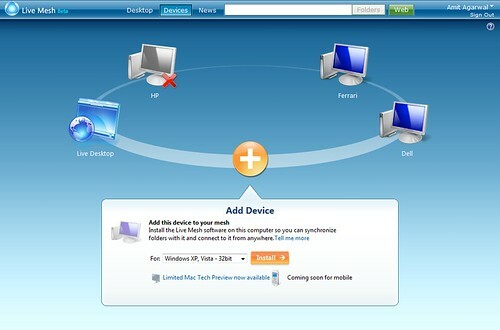 Windows Live Sync also lets you remotely access your files on the hard drive from any other computer via the browser without setting up synchronization. This is handy in situations like where you have to download a presentation from your work computer that’s saved on the desktop – just browse to the desktop folder via Live Sync website and download the file. Live Mesh includes everything that Windows Live Sync has to offer plus two extra features – cloud storage and remote desktop (with support for copy-paste). You first need to download the Live Mesh software and then select folders / files that you want to sync with other computers. The process is almost the same as Live Sync but here you can add folders for synchronization from Windows Explorer itself (right click any folder and click “Add Folder to Live Mesh”) while Live Sync only offers a web interface to explorer. Another important difference between Live Mesh and Windows Live Sync is Live Remote Desktop – Live Mesh lets you completely control the remote desktop just like other screen sharing application. You can even copy files and folders from the remote desktop to your local desktop through simple copy paste – copying folders manually is not possible in Windows Live Sync. Which Live Service is right for me? As expected, each of these Live services do have some overlapping features. Live Skydrive is for online storage, Live Sync is primarily for folder synchronization across computers (no storage) while Live Mesh offers a good mix of both though with limited storage space(5GB). Therefore my suggestion would be to go with SkyDrive as well as Live Mesh – you’ll get plenty of storage space plus remote desktop plus you can access important files from any other computer. Later today we should see the reincarnation of MSN Toolbar in beta form (codename Salsa). Like many older MSN products, it migrated over to the new Windows Live brand early 2007, however as part of the gradual drift back, its been revamped with a new look. So what’s new apart from the Vista styled UI? Well perhaps the biggest thing is that the toolbar is powered by Silverlight, which adds an extra dimension to the features on offer. This enables the drop-down MSN chanel previews, showing the latest content from within the MSN portal without requiring the user to move from the internet page they are currently browsing. From the same preview pane users can also chose to search that part of the site, which brings us onto the 2nd main feature – Live Search. Finally there’s a breaking news feature, bringing the latest news direct to your browser. At the end of the day though, a toolbar is a toolbar, so there’s not a huge amount to get excited about – what is exciting is seeing just how much Silverlight could be used for. Of course there is the added bonus for Microsoft in that requiring users to install Silverlight for core products such as this will increase penetration into the mass-market. And that’s not necessarily a bad thing. Users who want to participate in the managed beta on Connect will be able to sign up soon through the Available Connections page. The toolbar homepage is also up, however there is no download available yet. I wonder how heavy it is? Didn’t get the digital camera you wanted for Christmas? Then maybe you should consider buying yourself one of these, an UltraCamX Large Format Digital Aerial Camera. Producing images with a 216 megapixel resolution, these cameras are used to take the high-resolution imagery used within VirtualEarth/Live Maps. A word of warning though, Microsoft’s press release in Nov 2007 shows that only 3 UltraCamX systems have been purchased in North America since they went on sale in May 2006. Better start saving for next Christmas then. Of course you’ll also need to buy a “low cost” data unit as well to keep the images taken, which with storage of 1.7TB will apparently be enough for approximately 4700 images. With a camera like this, its easy to see why the monthly Virtual Earth imagery additions consist of TB’s of data. December saw 36TB added, including 44 new cities that feature UltraCamX imagery. Unfortunately most of the new additions are within the USA, however Tokyo was lucky enough to be part of the update. The images are so good that at full zoom you can even see the lines dividing the running tracks at the athletics stadium – check it out. Confused what Microsoft’s Windows Live is — and isn’t? This gallery is designed to help demystify Microsoft software services initiative, as well as to capture for posterity the rapidly changing Live family. It is easier to show than tell what Microsoft’s Windows Live is — and isn’t. Here are as many screenshots as I could round up of some of the shipping, beta and still-officially unacknowledged set of Microsoft software services known as “Windows Live.” Because Microsoft is in the midst of a rebranding campaign and strategy shift in the Live space, any of these services could disappear at a moment’s notice. You’ve been warned. First up: Windows Live Alerts. Still in beta, this free instant-notification service is currently free and available in the U.S., Canada and China only. “However, some content providers may charge for using their content with our service. Wireless service charges may apply for receiving or replying to alerts on wireless devices. Check your wireless service plan for details,” Microsoft cautions testers. Windows Live Mail now "Windows Live Hotmail"
Microsoft says that during beta testing, which began last March, it learned that users were “extremely loyal to the Hotmail brand” and “a bit confused by name change.” Therefore, it hopes the Windows Live Hotmail name will reiterate that the new service retains what users liked about the old system. Initial responses weren’t that positive, however, noting the constant name-changing and rebranding going on under the Windows Live moniker. “I understand the notion of loyalty; however, this is a new system and a new service. So why confuse users by merging two names of dissimilar systems. Starting new needs to be seen not as a detriment but as a way to start fresh and lure new customers into the system,” replied a user named Dave K.
Other users asked how the name change would affect Windows Live Mail Desktop, the Windows-based application that integrates with the webmail service while offering support for third party POP and IMAP e-mail accounts. “So will we have ‘Windows Live Hotmail Desktop Mail for Windows’ soon?” quipped a user named Gregor. As more Windows Live services launch out of beta in the next few months, one of the unanswered questions still remains around premium subscribers. Some good news for Hotmail Plus users comes in the form of Windows Live Mail Plus, which is currently only marketed in Holland. While the addition of 4GB storage may seem like overkill for email, Gmail is currently on ~2.8GB, it makes more sense if you can share it between services. While Live Drive is not yet released, this would seem like an appropriate place for it to integrate with Windows Live. Here’s a little something to kick off our birthday celebration in style! Back in October, we reported on Project Nemo, a Windows Live product for Media Center being developed behind the closed doors of Redmond. Well now the little project has made its debut on Windows Live Ideas (for some reason you must be signed into ideas.live.com with a US Live ID for the link to work). Ten points for each person you can identify in the shot. • Make free PC-to-PC calls to other Windows Live Messenger users. “Windows Live for TV is an early beta 3D browser application that makes it easy to connect to your social network as well as friends and family from within Vista Media Center or IE7.0. You’re be able to view the best of Windows Live Spaces and communicate with Friends and Family over Windows Live Messenger 8.1 with voice & text chat as well as make a phone call. For those of you out there who are hoping to use it on Windows XP Media Center, I think you are going to be out of luck. WL for TV will require a PC running Windows Vista Home Premium or Ultimate. Just to be clear, the project is no longer being referred to as Nemo, the new codename is Orbit.